2015 was a rough year. There is no other way to put it. We looked over the precipice at some of the worst possibilities becoming reality. But we came through. Luna stared down an extremely dire diagnosis and is once again thriving. For that I am truly grateful. I rebounded strongly from my own health issues as well. 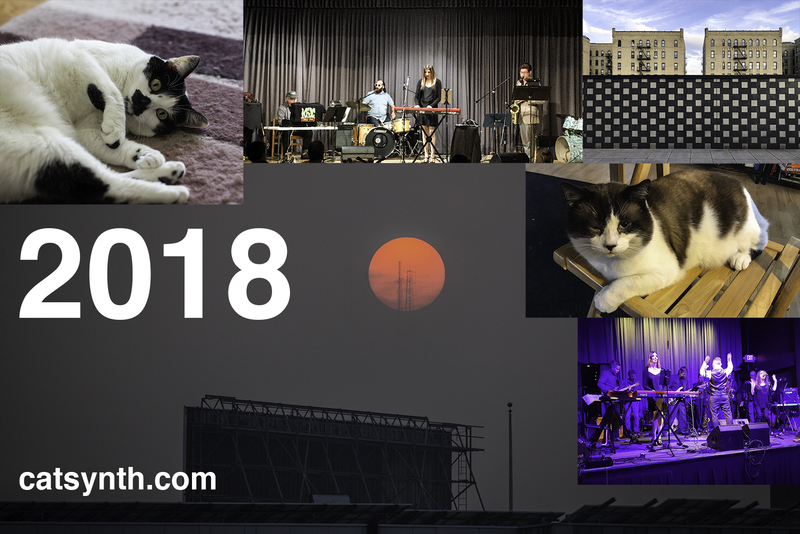 And there were many other beautiful moments this year, a few of which are included in our graphic. 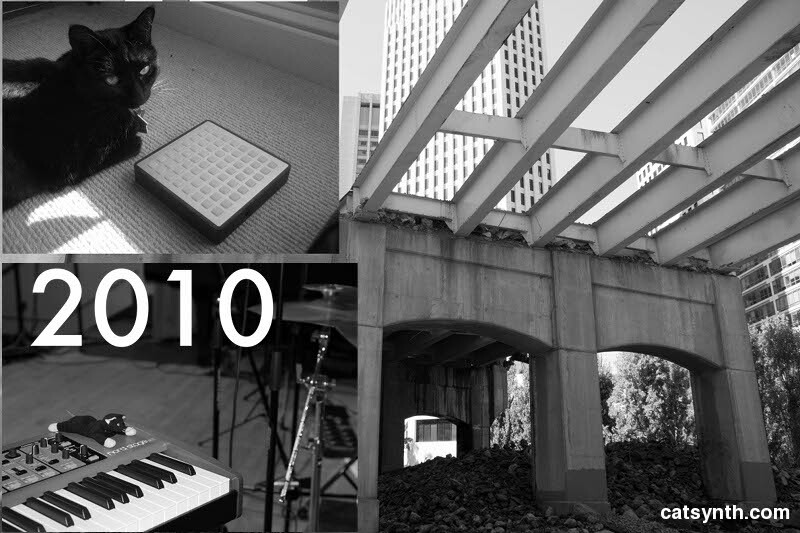 This was a year of many endings as well, most notably in the personal and musical domains. But new doors are opening for 2016 as a result, and there are some new projects and opportunities for which I am excited. 2015 left a lot of questions unanswered, some of which are also depicted in the graphic and some of which are beyond the scope of this site. So we are excited for 2016, but also extremely anxious and apprehensive. There are more big challenges coming up; and if I have learned anything, it is that I have no idea how things will ultimately turn out. It’s just a matter of doing things one at a time incrementally – but also continuing even more than ever to speak my truths and accept the risks and consequences that come with doing so. Meanwhile, we at CatSynth will continue to do what we do here, bring music, art, culture and cats to the world. Thank you for all your support in 2015, and especially all your support for Luna and me. We are truly humbled and look forward to sharing this new year whatever it brings. It’s time for our traditional end-of-the-year image. It is always a challenge to decide what to include, but we thinks this captures a few of the significant elements. 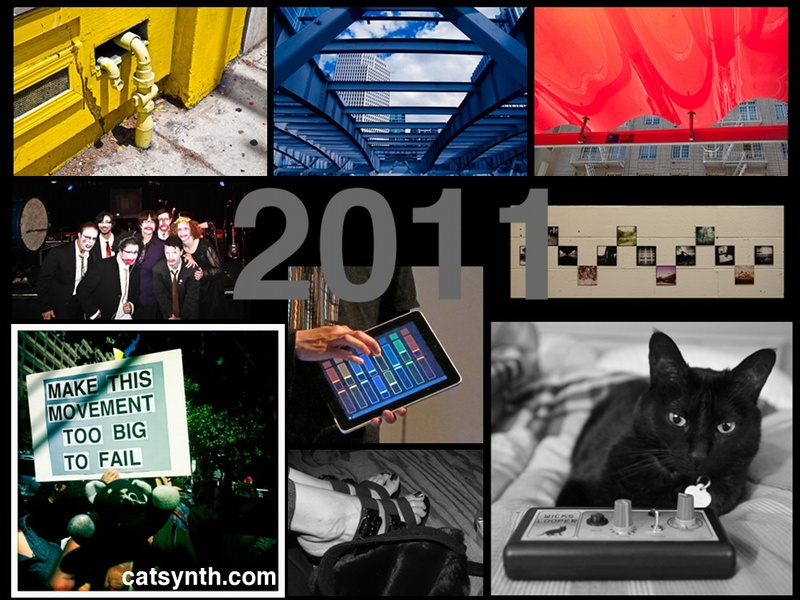 2012 was a crazy and at times and a bit nerve-wracking, but it full of richness and opportunity. I except more of the same in 2013. It’s going to be a busy and challenging year ahead, but I hope to be able to continue to keep this site going and maintain the friendships I have made here. 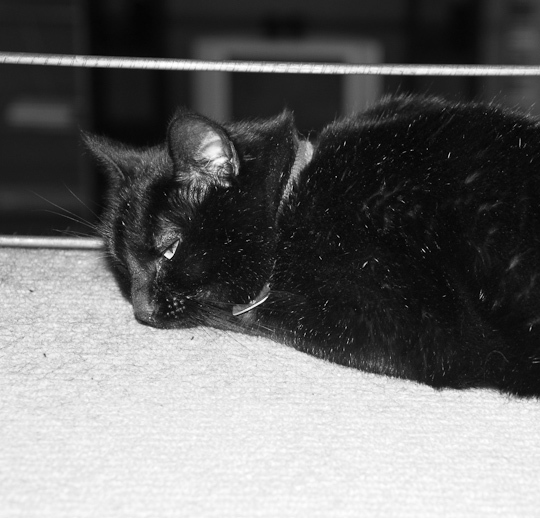 The theme of this weekend’s Photo Hunt is fuzzy, which is easy with Luna around. One can easily see the fuzziness of her thick winter fur. Cats do seem to get thicker fur in the winter…and contrary to stereotypes, we do have a winter season in California. This may end up being about as much as we do today. Weekend Cat Blogging #291 New Years Edition is hosted by Pam and the cats at Sidewalk Shoes. The Photo Hunt is hosted by tnchick. This week’s theme is Fuzzy. The Carnival of the Cats will be hosted by Nikita Cat. This is not a convenient day for the year to end. January 1, 2010, was a calm, and truly monochromatic day, which set the initial tone for the year and the first photo I posted reflected the tone. It was turning away from the excitement and adventures in 2009 towards a more inward and local focus on creativity and relationships…and finding a new job. And at the end of the year, much of that remains true: more creative output, both musically and visually than ever, new friends (and deepening ties with old friends), and I did get that new job. But the pace and energy are anything but calm. Life has been hurtling forward at a faster and faster pace, with an ever higher density of activity and experience, and that can’t keep going forever. There are limits. Limits in time, in resources, and in my body. Slowing down is not easy, and may not even be necessary, but this coming year is going to be about doing the best I can within those limits. In terms of this site, there is always the tension between experiences and writing about those experiences, and lately I have been erring on the side of experience versus writing about it. It’s a continuous process to learn how to balance that. Things don’t always look particularly bright when you’re in the middle of them. This year (like most) was riddled with mistakes and failures, missed opportunities, and more. But if, say, “2008 me” got to look ahead and see “2010 me”, he would probably be amazed at how much has changed…mostly for the better. I saw another interesting perspective yesterday when a friend, in saying good riddance to 2010, pointed around the table and said (and I paraphrase) “your 2010 sucked”, “your 2010 sucked” and then when she pointed to me said “yours was actually pretty good”.